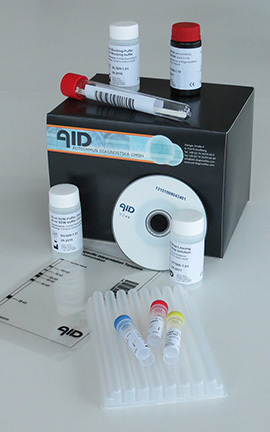 AID Immunoblots are based on Westernblot method and work with electrophoretic separated protein mixes. Unlike lineblots with recombinant protein, AID Immunoblot are produced with total cell lysates of bacteria or viruses. Benefit of this classical method is the presence of complete epitope set of a pathogen for detection of specific antibodies. For detection of autoantibodies also total cell lysates are used, providing a broad spectrum of epitopes. Immunoblot is not only suited for confirmation assay but also for monitoring of disease progression by detection of relevant antibody pattern. Immunoblots can be evaluated manually or by AID Immunblot/Genoblot-Scanning System quick and easily.